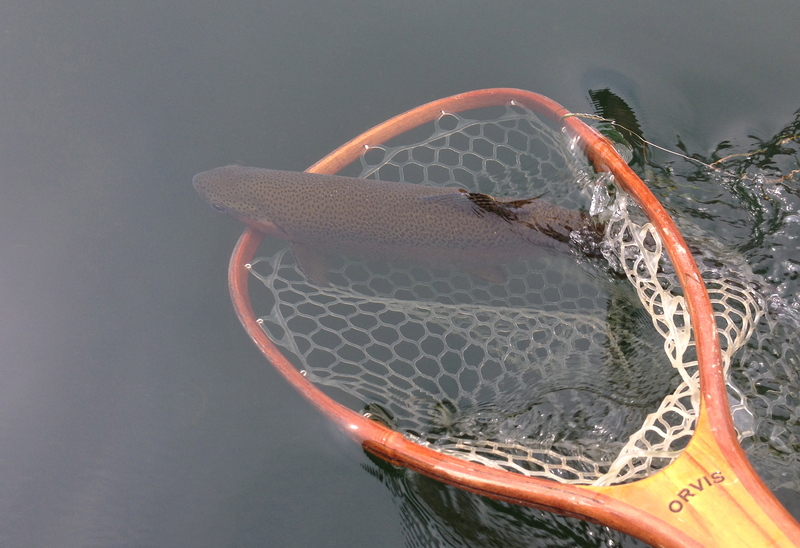 Be on the lookout for rainbow trout redds when you are wading. Spring is about to have sprung on the calendar, and the rainbows will soon be doing their thing. That means some ornery trout, and with the water temps creeping up, feisty browns, as well. 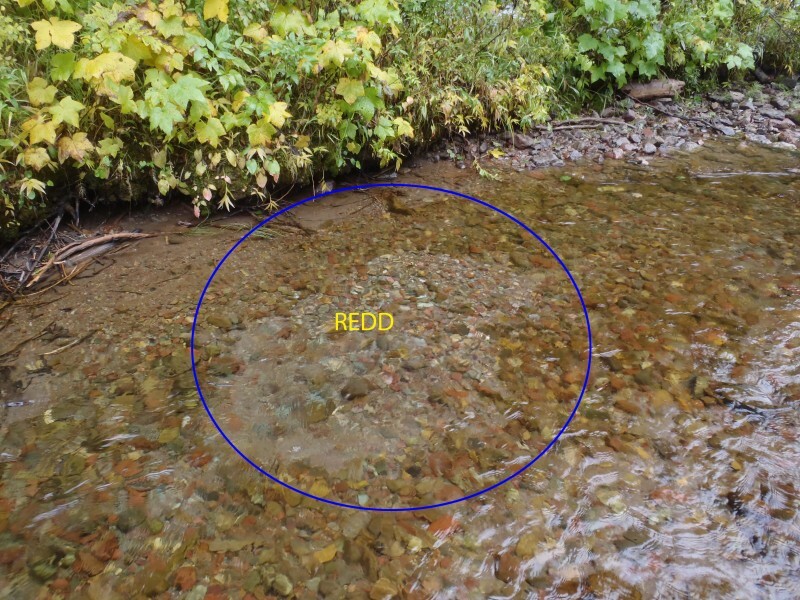 When you’re out on the water, PLEASE be mindful of redds (trout spawning beds). You’ll find them in shallow, gravelly areas with a nice, steady current flowing over them. A redd looks like a shallow, scooped out bowl of cleaned gravel that stands out from the surrounding darker, weedier gravel. (See the photo above.) You may or may not see trout on the redds, but either way, just admire the trout’s innate desire to perpetuate the species and leave those areas alone. Whatever you do, do not walk through redds. Be careful where you wade. It’s always important to treat trout carefully, but it’s especially true during spawning season. I believe in catch and release but also know this is a “blood sport” of sorts and fish do die, even after being treated with care. (Here’s an interesting TU blog post by Kirk Deeter from a while ago about C&R.). All of Montana’s rivers are managed for wild trout and Montana FWP does not stock rivers with hatchery fish. Montana stopped stocking our rivers in 1973, so the trout in the rivers now have to make the trout in the rivers for the future. That is why Montana’s tributary streams are closed from December 1st until the third Saturday in May. No matter where you live, if there are rainbows in your waters, feel free to go out and have a blast fishing this spring, but please, don’t TREAD on REDDS. Chris Strainer not only owns Crosscurrents Fly Shop (in Craig and Helena, Montana), but he also serves on the board of directors of his local TU Chapter and on the Citizens Advisory Panel of the Montana FWP Future Fisheries Improvement Fund. Great post, timely reminder. We need to be watching where we step this time of year. Good on Orvis for publishing this and not another “grin and grip” blog post. Some of the best photos are of fish in the water. Great post! Aside from walking on redds I would offer the suggestion to avoid fishing over the redds as well. Spawning trout will often hold position even when they see an angler and refuse to run until the absolute last possible moment and this makes them easier to approach and spot, especially in shallow water. Because of this it’s much easier to snag one while drifting a nymph or streamer across the spawning bed. Furthermore, they are typically pretty hungry because they expend a lot of energy during the spawn and that makes them less picky about sampling food-like objects that pass near them, which means they can be targeted fairly easily. So, my policy is to not walk or fish over spawning beds. Just let them do their fishy love thing in peace. Wise words, Dan! With Montana’s rivers and streams being managed for “wild trout” (not from hatcheries), it’s not good for the future if folks disturb those trout trying to spawn. Besides, who would like it if a bunch of yahoos busted in your bedroom during a “sensitive” time with your lady friend?!! It’s a so important alerts to us anglers. However are there any simple and easy way for beginners like me to find “Spawning beds”? Or they are obviously there? Patrick Duke is not affiliated with Orvis. He isn’t a brand ambassador and hasn’t been on our pro program since 2009. That said, this article has certainly prompted an audit of our own programs. It’s a great reminder that we all share the same responsibilities as anglers and conservationists. Excellent post/article Ryan! Keep fighting the fight. This conduct should make everyone sick to their stomach. Mr. Duke should have his ticket revoked by the regulatory board in Colorado. Southwest Wyoming is being ruined by this type of conduct. Ryan’s post ought to be required reading prior to getting a fishing license. While you can make more humans, you can’t make new streams. I think I am starting to understand why they call Montana the “last best place.” It ain’t next to the exploding population of Utah. Strange looking redd sans any indentation, but this year spring will be July in Montana.